← Did Wikipedia editors kill the Guardian & Independent? They say history is written by the winners. But the Citizen News Media are beginning to dominate the internet. If this new CNM end up writing the history of the “climate wars”, does mean we are the winners? So, even though sceptics would win, I felt the history would be written is such a way that no one would even realise academia got the climate issue so wrong. In other words, for all our hard work, the history books would never mention that stalwart band of heroes that stood in front of the climate bulldozer. But, suddenly things look different. 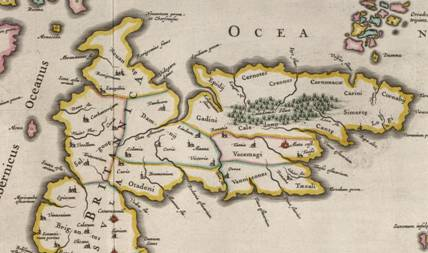 The map on the left is a depiction of the Ptolemy map of Britain (actually a series of co-ordinates). This is a direct depiction of the Roman map. It is clearly wrong as it should show Scotland but is distorted. For several hundred years academics have been interpreting this as being a problem with scale. That the map is right, but just too big, with most of the north of Scotland missing. As such the map on the right is typical. Note the “Calidones” … the tribe central to the battle of Mons Graupius. 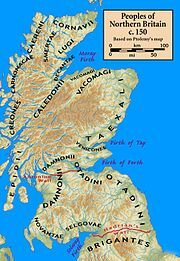 This tribe is located by this academic literature around Perth or Duneed on the East coast of Scotland. So that is the location where most people think Mons Graupius was fought. But there is another simple explanation for this map. Not that it is distorted, but that it has been turned on its side. 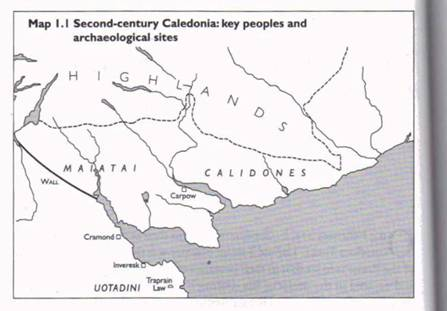 With this interpretation, the Caledonian tribe would now inhabit the area along Loch Ness to Inverness (The NE not East coast). And this is where I searched and found a most suitable location at “Quarrel Hill” near Elgin. However, in retrospect, it was inevitable that someone would find this location near Elgin, because if one looks on the internet, and not in the academic literature, the Caledonians are now almost universally located where I placed them – where Elgin would be the suitable location of Mons Graupius. New Location of Caledonians along Loch Ness. In other words, the CNM (Citizen news Media) now have a very different interpretation from academia and this is the mainstream view on the internet. In other words, in this area, history is no longer being written: by the academics, for the academics, with e.g. the academic “scientist” as hero and with the CNM “engineers” like John Harrison (who invented a clock that could navigate the globe). So is history still being written by the winners? Who knows? At the moment, the situation is that in many areas there seems to be two histories starting to develop. The one in academia and the other on the internet. Sometimes these are very similar, but in some areas like climate where academia fought with those outside and had very different views, there will be two very different histories. In one, the “climate wars” will be the fault the “ideation conspirators” who ignored the advice of their betters that … <you get the idea>. On the other, the history is being written by people like me, on climate blogs and about climate bloggers. In this history we will be small band of heroes that saved the peoples of the earth from the tyranny of global alarmism. Will it be the free-to-view internet sites like this where history is openly reviewed by everyone,which come to dominate. Or will it be read in musty articles, stored in musty libraries in musty universities or musty journals demanding their ransom to read a few scraps from a paper that the public has already paid for? … does that mean we are the victors? 5 Responses to History is written by the VICTORS! The Bad Guys seem to understand Search Engine Optimisation a bit better and their blogs usually come out ahead in search results. You can pay the search engines to make this happen too, although I can’t say that SkS and others are actually doing this. Blogs like yours, well-promoted and thoughtfully written, are a good way of making sure that in numbers of hits, the sceptic narrative gets a fair showing in search results. I suspect believer sites are written by teams of people trying to “get the message across” to the numpties who are sceptical of those who believe they are god’s gift to human knowledge. They have bags of money and probably are written with teams of people including PR consultants and media consultants. But sceptics just do it for fun! The Ptolemy map looks to me like just the north of Scotland, with the Firth at the bottom being Ness. The Orkney position fits that perfectly and western isles closely. In which case the Caledones are centred just north of the Black Isle. I suspect the existence of the highly fertile BLack Isle area may affect the population demographics of the time allowing the existence of a large enough warrior population within marching distance to fight Mons Graupius. Archeological information, not available to past academics or even to anybody today will probably settle the questions. Tim Ball’s new book The deliberate corruption of climate science is a very interesting read. It shows and traces the history of the scam. it is central to the whole debacle and is a point most have totally overlooked, that although Maurice Strong is not an academic, he is undoubtedly far cleverer / smarter / shrewder than most. Maurice Strong is not a politician, but he has managed to dictate (via UN and IPCC reports) so much that is the current environmental fears based global politics. Tim Ball is not a paid for shill, so it may well be that those half in and half out of academia will hold the sway. Whistle blowers as such, and the internet is a mighty powerful tool for whistle blowers.